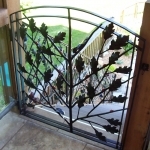 A family owned & operated Blacksmith shop creating hundreds of hand forged items icluding everything from small hooks to large custom gates. 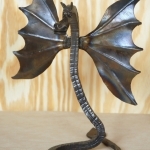 Our motto is "If you can dream it up, We can forge it out" See our wesite to order or for more information. 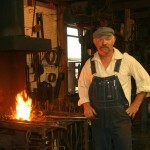 Tony started working in a Blacksmith shop at age 12. He continues to strive for better quality and to learn more of the craft. “No man can learn all there is about blacksmithing in one lifetime” a quote from the smith who taught Tony. Many who know him consider him a master craftsman and artist. If you ask him, He may simply reply, “I do what I do”. He was once asked,” Why do you love this so much” His reply, “There’s always something new to do and more to learn”. 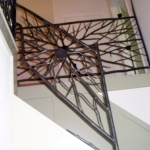 Tony has more than 35 years experience as a smith and loves the challenge of doing custom work. 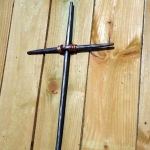 Everything made at Irons in the Fire is handcrafted using traditional methods as well as modern blacksmithing methods. The majority of our business is custom work, so let your imagination run wild, bring us your idea and we will work with you to create it. Irons in the fire is located near the Lake of the Ozarks ,where Tony lives with his wife Sheri and two young children Daysha and Wyatt.